Written by Michael with Lionel Richie, as America's answer to Band Aid's Do They Know It's Christmas, and recorded by USA For Africa to aid famine relief in Ethiopia - issued in March 1985. Chorus included La Toya, Randy, Marlon, Tito and Jackie Jackson (but not Jermaine or Janet - the latter was particularly upset at not getting an invite). No.1 on both American charts, and in Australia, Belgium, Holland, Italy, New Zealand, Norway, South Africa, Sweden and the UK. No.1 best selling single of 1985, and no.5 best selling single of all time, in the USA. Estimated global sales: 7 million (about the same as Band Aid's Do They Know It's Christmas). Grammy Awards: Record of the Year, Song of the Year, Best Pop Vocal Performance by a Duo or Group, Best Music Video - Short Form. American Music Awards: Song of the Year. People's Choice Awards: Favourite New Song. A second version was recorded by Children Of The World (a group of children including Drew Barrymore, Kim Fields and Alfonso Ribeiro) - Michael is on record as saying he prefers this version. "Since first writing it, I had thought that song should be sung by children," he said, "When I finally heard children singing it on producer George Duke's version, I almost cried - it's the best version I've heard." USA Foundation for Africa, by the end of 1985, had raised around $40 million to aid famine relief in Africa. It was part of a lawsuit heard in Mexico in 1993, when Robert Smith (aka Robert Austin), Reynard Jones and Clifforf Rubin claimed in infringed the songs, What Becomes Of The Children and If There Be You - the judgement was in Michael and Lionel Richie's favour. Performed by Pavarotti & Friends concert in 1999, by Pavarotti with Boyzone, Mariah Carey and Lionel Richie - Michael was scheduled to appear, but cancelled as his son Prince was unwell. Performed by Michael and his guests as the finale of the Michael Jackson: 30th Anniversary Celebtration, The Solo Years concerts, staged in New York's Madison Square Garden on 7th and 10th September 2001 - omitted from the televised edit. Performed by Michael and his guests at his 'Celebration Of Love' 45th birthday, staged in Los Angeles on 30th August 2003. Demo version by Michael included on his box-set, The Ultimate Collection, issued in November 2004. I wish that people all over the world take note of all the words in the song, especially now when there is so many terrible acts being committed. What a wonderful song! Just beautiful! Love you Michael! You always wanted to make this world a better place. Miss you so much. Lots of budhism wisdom in this song ! !I love it!! i wish peace love and unity to the whole world !! Hugs to you dear MJ's Fans! 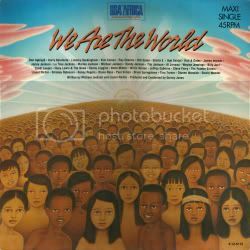 Each time I hear We are the World, I always have gooseflesh. I was so happy when I saw that they have keep Michael part in the new version and I'm sure that this song will never die because she tells things that happen every single days. Today is 25 years after!!!! One of the most beautiful songs ever written. Thank you Michael!!! I miss you so much !!! Wish you were here celebrating with us. A song for the world, for the children. LOVE YOU ALWAYS!!! I remember I was I think about 6 or 7 (in 1994 or 1995)the disney channel show the we are the world rehearsal. I want to see michael and and all the other singers I knew about. I remember have a big smile on my face watching everybody in action. This is one of the manny things about michael. that made me want to do music and I'm proud to say. Le plus bel hymne mondial pour la paix ! bravo a mike & lionel! Moi aussi je préfère la version demo de mj bourrés demotions! mais cette version n'en reste ni plus ni moins qu'un pur chef d'oeuvre!!! Gran canción que entrega un hermoso mensaje para cada uno de nosotros. Además tiene el plus de que participan grandes estrellas de la música de aquel entonces. Es un verdadero himno. Love this, its beautifull, without doubt one of the all time classic anthems. this song gave and stll gives me goose pumbs. What a line up of musical legends, it will never get better than this, ever. Steve Wonder, Bruce Springsteen, Bob Dylan, Ray Charles, Paul Simon, Tina Turner, Lionel Richie, and a certain Michael Jackson plus others. j'adore cette chanson, elle est magnifique c'est une superbe oeuvre et michael a une la superbe idée de l'écrire !!! mike i love you ! !